We stayed four nights in Arles, Thursday to Monday. The annual Feria du Riz, a celebration of the rice harvest with music, art, and Spanish-style bullfighting, was held on Friday and Saturday. We stayed in a VRBO apartment just outside the walls of the vieille ville (old town) on Rue des Alpines. The location of the apartment was excellent, less than a five-minutes’ walk to the Roman Arena in the center of town, and with parking only 20 meters away at the end of our street. I cooked only one time during our stay: a simple roast chicken and some ratatouille. We ate these with a green vegetable salad and some bread. I cheated on the chicken. I went to the Saturday farmers market in Arles and picked up some eggplant, zucchini, red bell pepper, tomatoes, onion, and garlic for the ratatouille. It was my intention to buy a small chicken to roast, but as I walked by a chicken vendor’s stall, a vendor who was selling not only fresh raw chicken but also the most delicious-smelling roasted chickens, it occurred to me that I could save a bunch of time by using a pre-roasted chicken. So I bought one: a “plein-air” farm chicken. These are smaller, sort-of heirloom varieties lacking the large bosoms of the modern mass-market chickens we see in the US. I reheated it in a baking pan over some onions, tomatoes, and olives. It turned out delicious. I made the ratatouille the traditional way, cooking each of the different vegetables alone to get each to the correct level of doneness, and then combining them in a bowl with a little more olive oil, some salt and pepper, and a little thyme. Bon appétit! Arles is a compact, walled Roman city. We parked and unloaded the car and didn’t get back in it until it was time to leave for our next destination. The map below shows the locations of many of the interesting sites in the city. You can see from the map scale that the old town of Arles is not a particularly big place. Our apartment’s location is at the right, circled in green. With the running of the bulls, strolling musicians, the hustle and bustle of the city preparing itself for the Feria, and the festive mood of the locals and tourists alike, it was an interesting and colorful time to be visiting. We hope you enjoy the gallery of photos from around the village. 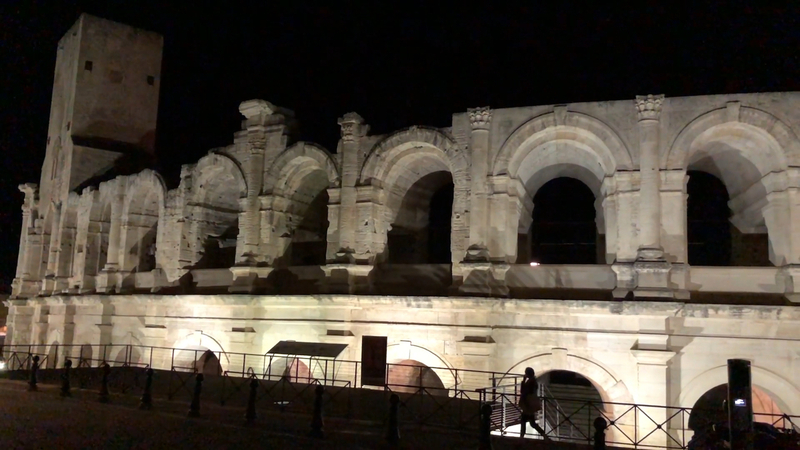 Les Arènes d’Arles, built by the Romans in the 1st century, has been used, preserved, rebuilt, and repurposed many times. It is used today as a venue holding about 21,000 spectators for Camargue- and Spanish-style bullfights, and for concerts and variety shows. As you can see from our photos, it is in remarkably good shape. It is a must-see, in my opinion. The Michelin Green Guide gives it two stars (out of three). Please enjoy the short slideshow and video below. No Comments for "Four Nights in Arles"